Product Leadership: the best product through innovation. Companies who seek to excel though Operational Excellence seek to have the lowest total cost compared to their competitors. This total cost would include all service costs and also the costs of any “process rework” - fixing mistakes that have arisen though the manufacture or delivery. Hence, one of the hallmarks of an operationally-excellent company is the very low process failure rate. In addition, these companies remove as much “waste” as possible from their processes and demand the same from their suppliers – Dell, for example, keeps just two hours' inventory at its factories. Its suppliers have had to build warehouses near Dell factories in order to meet Dell’s demanding contractual terms. By being such a major customer, Dell has had the power to offset the cost of holding inventory to its suppliers. Operationally-excellent companies also realise that too much customer choice creates “lumpy”, inefficient demand. They would seek to smooth this demand by creating more flexible capacity create new demand in the currently-slack periods. In order to expedite this, the company may choose to concentrate on particular customer niche or demographic rather than trying to appeal to all customer sectors. Customer-intimate companies are those that define themselves as not just providing goods or services, but as helping their clients be successful. This mindshift from being a supplier to being a partner is a core component in these companies’ thinking. This joined-up, boundary-less approach pays dividends for all parties: the company, their suppliers and their customers. The customer-intimate company will have a detailed knowledge of their customers’ needs and buying habits. Until recently, this personal knowledge has been the provenance of small, local businesses dealing with regular customers on a face-to-face basis. Recently, this ability to gather customer-intimate knowledge has become available to large companies by the use of technology – the loyalty card. While ostensibly of primary benefit to the customer by giving free air-miles, discounts or cash-back, these cards are critical in allowing large companies to track the buying habits of their customers. One of the UK’s leading exponents of this is the supermarket giant Tesco, with their “Clubcard” scheme. In effect, Tesco's customers are selling information on their buying habits in return for discounted goods. The companies that seek to differentiate by product leadership are characterised by a leading-edge “must-have” product or service. Companies that fall into this category are Apple (hi-tech hardware), Nike (sportswear) and Sony (electronic devices). They are categorised by a firm operational focus – usually with a business strategy that can be summarised in one paragraph or less. They hire the best people and give them the freedom to innovate – not only for new products, but they will have differing teams competing internally to produce products that will obsolete their current best-selling lines. In order to achieve this, the company has to have a highly fluid and dynamic internal structure, with overlapping, self-organising teams and placing low importance to job titles. Of these three disciplines, the authors argue that all companies should decide on which is best suited for them and then choose to excel in it. 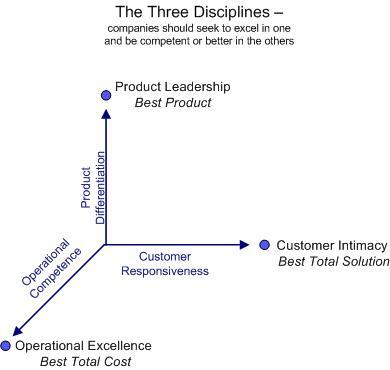 The other disciplines should not be neglected; there is no point being a product leader if the customer service is lousy. It certainly makes sense to be competent in the other two disciplines while excelling at the chosen one. [Reviewer’s note: It is a rare company indeed that manages to excel in more than one: arguably the only UK-based example is Tesco, which manages to excel in Operational Excellence through world-class supply-chain processes and Customer Intimacy, through its loyalty-card scheme. Interestingly, Tesco has achieved such a dominant market position by excelling at these two disciplines that it has led to accusations of monopolistic practices]. The authors outline how a company should go about achieving excellence in one of the disciplines. Firstly, it must decide their own current position is and that of their competitors, in relation to the three disciplines outlined above. [Reviewer’s note: one approach would be to use Kano analysis to understand customers’ needs to provide input into this exercise]. both now and in the next three (or five) years. It will also decide on how these benchmarks could be achieved by a market leader. Lastly, the company must look in detail at what options are available to them from moving from their current position to a future state of being market leader. The authors argue that the future state should be firmly centred on one of the three disciplines they describe. This classic book was written in 1995 (with small revisions in 1997) - well before the commencement of large-scale, on-line consumer buying - but it has aged well. The authors’ message is easily distilled and applied to more recent market channels. It remains one of the definitive resources for senior executives seeking to improve their organisations’ market-share. "Good to Great" by Jim Collins. A seminal book on the characteristics that turn good companies into world-beating ones. At Agilier, we ensure that all our business-change initiatives are aligned with your corporate strategy - ideally a strategy that is centred on one of Treacy and Wiersema's three disciplines.